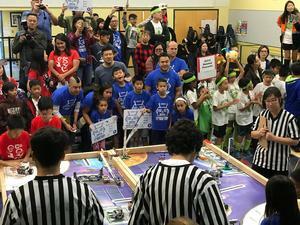 Congratulations to the Carver FLL teams that competed in the November 10th Qualifying Tournament! Three Carver teams will advance to the LA Championship tournaments on 12/8th and 12/9th. Congratulations to the five Carver First LEGO League (FLL) robotics teams that competed in the November 10th Qualifying Tournament! Among the 21 teams in the tournament, 4 teams will advance to the LA Championship tournament. Three of the four teams are from Carver. The Pioneer Primes Gold team was engilded with the 1st Place Champ’s award! The Pioneer Primes Gold team won 2nd place at LEGO Land last year. The newly formed Brick Bots team raised the bar with a solid slab of teamwork earning them 1st in Core Values. The Mutated Peacock team recently evolved from the Pioneer Primes Blue team to prove their plumage and pulled in with 2nd Place in Core Values. 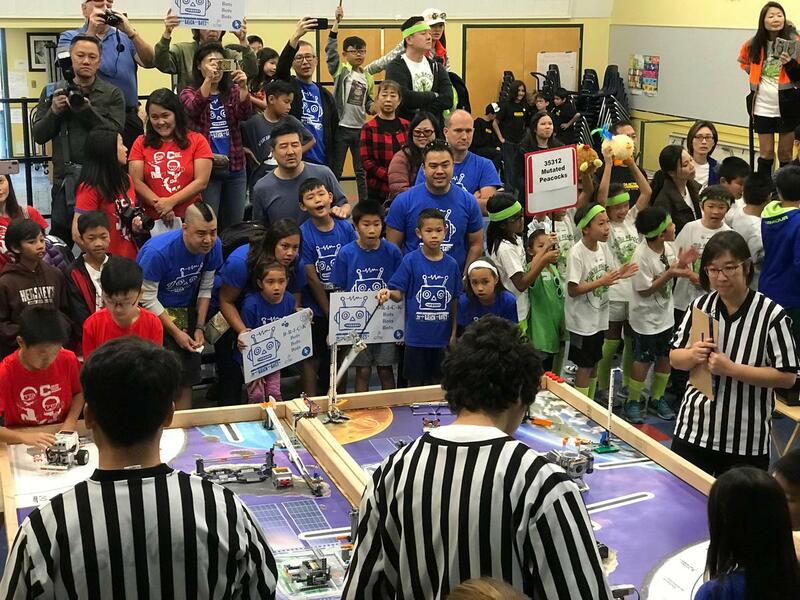 San Marino schools cleared out the top four spots with Valentine FLL Team, Cyberspace Vikings, who also will be heading to the LA Championship, having won 1st in Project. Congratulations also to Mrs. Nickie Oh-Saxon for being awarded the Volunteer Award! The Pioneer Primes Gold (Team #35313) consists of Brandon Chan (Gr 5), Max Zhou (Gr 5), Tin Ma (Gr 5), and Peter Chen (Gr 5). The team is coached by David Zhou (Admin Coach) and Albert Chan (Team Coach). They will be competing in the LA Championship on Saturday, 12/8th, at La Canada High School. The Brickbots (Team #35315) is composed of Ava Freiburg (Gr 4), Declan Li (Gr 4), Layla Shen (Gr 4), Matthew Woo (Gr 4), Aiden Wu (Gr 4), and Ivan Yang (Gr 4). The team is coached by Lauren Shen (Administrative Coach), John Freiburg (Team Coach), Lyndon Li (Team Coach), Jerry Shen (Team Coach), and Richard Wu (Team Coach). They will be competing in the LA Championship on Saturday, 12/8th, at La Canada High School. The Mutated Peacocks (Team #35312) consists of Brandon Chuang (Gr 5), Brandon Chung (Gr 5), Marcus Wang (Gr 4), Angela Li (Gr 5), Adam Li (Gr 5), Maxwell Shen (Gr 5), Matthew Chan (Gr 5), and Elliana Wang (Gr 4). The team is coached by Macy Luk (Administrative Coach) and Gene Chuang (Team Coach). They will be competing in the LA Championship on Sunday, 12/9th, at La Canada High School. Please click here for more information on the upcoming FLL Tournaments. For parents who are interested in forming an FLL team next year, we will be posting information on the school’s website sometime in the spring of 2019 with instructions. In the meantime, all are invited to visit the LA Championship tournaments at La Canada High School on 12/8th and 12/9th.